She's Fantastic: DC Collectibles New 52 - BATGIRL! DC Collectibles New 52 - BATGIRL! 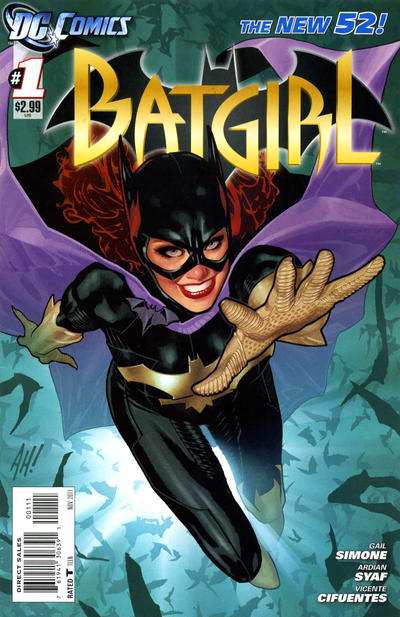 Batgirl is the first Superhero I ever became obsessed with as a young comic reader. I used to scavenge for old issues of Batman Family in dollar bins. She didn't have many modern comic appearances in those days so I was revelling in classic reprints. But then suddenly there was a Batgirl Special #1 on the stands in 1988 and I was such an ecstatic little kid about it. Until, of course, I realised that issue was just a preamble to the horrible events in Batman: The Killing Joke which left my Barbara wheelchair bound and out of the bat-suit for 23 years. (Not to diminish her significance in the DCU as Oracle, but I just love a good Bat-Lady). 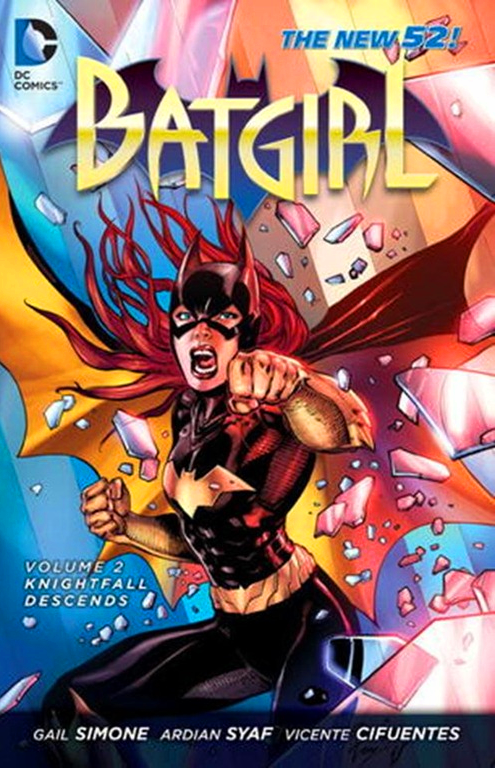 The infamous 2011 DCU New 52 reboot put Barbara Gordon back under the cowl. I had major mixed emotions about this. 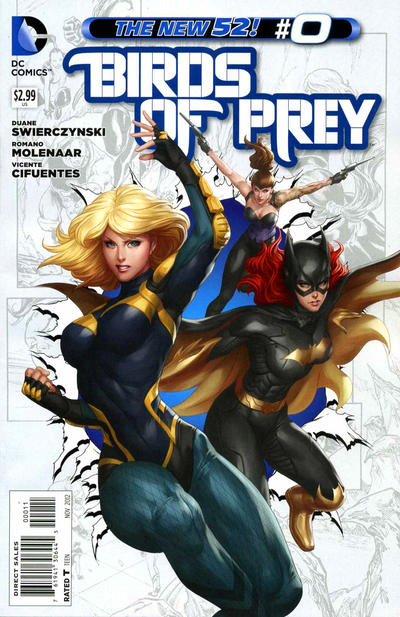 I liked Oracle, I loved Steph Brown as Batgirl, and I did not like her little girly bat-clasp in the new design. But having Babs back in her original role could be really cool. The underlying excitement for me was honestly the potential for new toys though. My merchandising hunch has paid off and we've already seen more new Babs products than we have ever seen of Steph or Cass. Unfortunately the solo title that resulted from the New 52 never thrilled me. 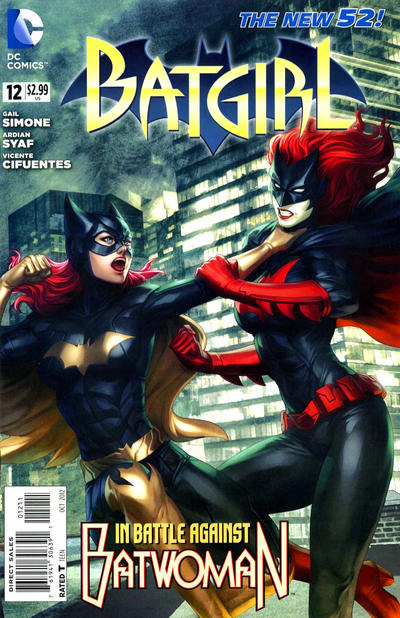 It just paled in comparison to the Steph Batgirl stories that ended so abruptly before the reboot. (But I actually really did like the new Babs in Birds of Prey). I'm definitely looking forward to the new costume and creative team next month. I've been buying the book every month for years, but it's shockingly my least favorite title. So, yeah, I'm really looking forward to the changes. Anyway. Sorry for the rant. I just love Batgirl. And coincidentally I happen to love this action figure. 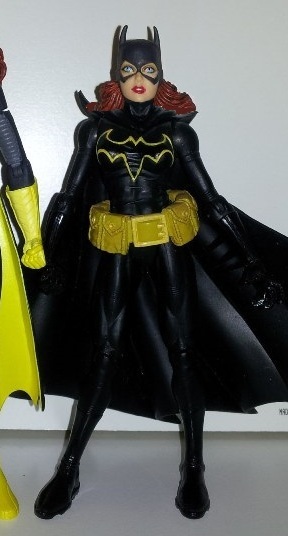 In my opinion the Mattel New52 Batgirl was a train wreck (only because of her insane neck-cone). This Batgirl is amazing though. Let's check her out! (but of course, so is Jack). Batgirl comes with a grappling gun as her accessory. It's a cool alternative to the standard Batarang, but unfortunately her hands are cast in a really rigid plastic and she cannot hold the fat gun grip easily. I'm sure with effort I could squeeze it in, but I don't like the accessory enough to risk snapping her thumb off. The string can be pulled through the back end of the gun to make the spearhead retract. 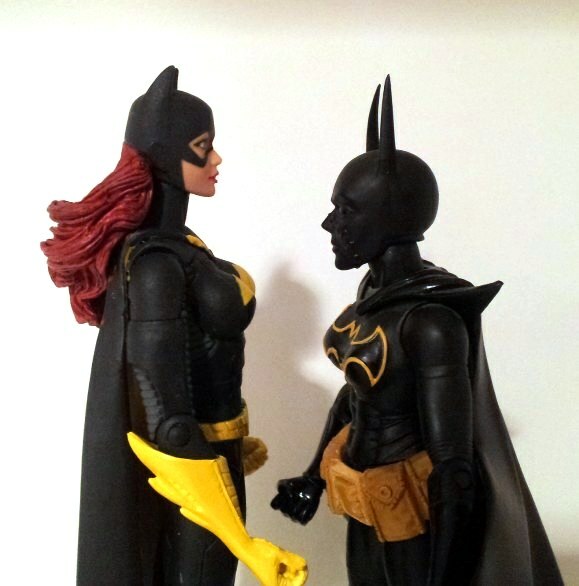 Batgirl's articulation is pretty good. She has a ball-jointed neck (which provides more range of motion than you'd expect considering her hair), swivel & hinge shoulders, upper bicep swivels, elbow hinges, gauntlet swivels, ball-jointed hips, hinged knees, boot swivels, and hinged ankles. One problem I had with the articulation is that I wish the ankles could allow the feet to point upward. The range of motion only allows for flat-foot and toes-pointed positions. Without a way to properly position a rear foot in a dynamic stance (combined with the lack of torso articulation to balance her out), she is really only poseable in standing poses or flight poses. 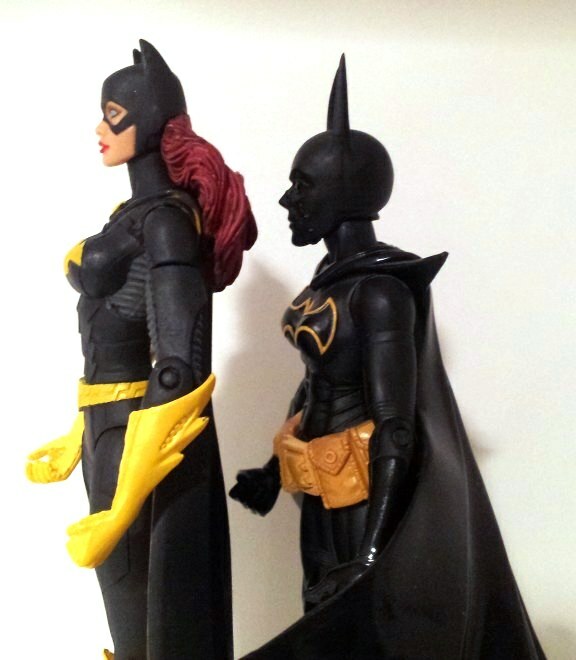 The paint of her (dreadful) bat-clasp is sloppy on almost every figure of Babs I saw. I temped to paint it over black. Also, in these pictures, the differing highlights in her eyes make her look a little crazy, but in person her eyes are painted with a gloss paint and they look really good (I know, I'm amazed too). Also, one other thing. There are a few cases on this figure where small areas of paint have been transferred to other parts. For instance, there is some red (hair) paint on the back of her cape. And there is some yellow (cape) paint on her upper back. These are pretty insignificant production issues, but worth noting nonetheless. Another great paint detail I didn't pick up on in the solicit images is that all the "ribbed" portions of her costume (inner arms, lats, inner thighs) are all painted gray. This has a very dynamic look in person. Here are some images from the comics. The original New52 design had a Purple cape lining and a black bat-clasp. Eventually it changed to a golden yellow lining, but the clasp (when the artists even chose to draw it) was still black. I'm not sure why it's painted yellow on this toy. Here she is with the 2013 Batman Unlimited figure from Mattel. Note: This is my customized figure after I attempted to fix her weird neck. See it all here. 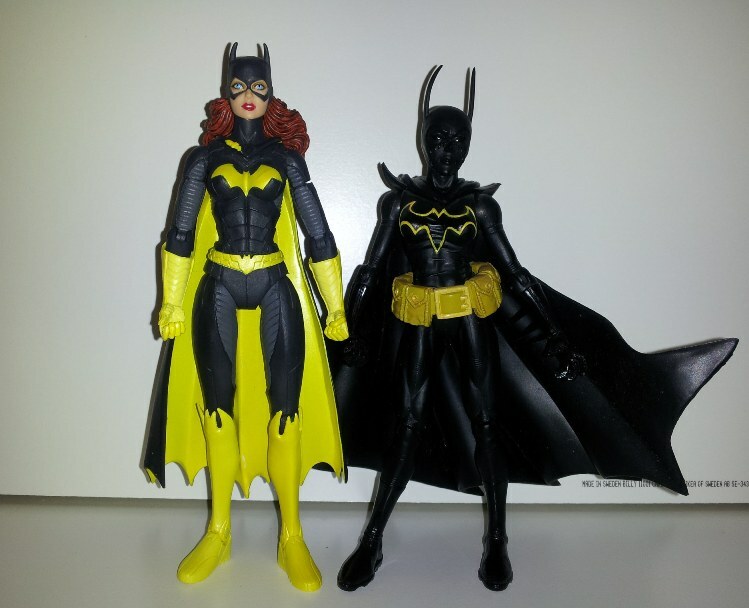 Here she is with DC Direct's 2008 Showase Presents Batgirl on the Left and Justice League (Alex Ross) Series 08 Batgirl on the Right. All three coincidentally sculpted by the amazing Karen Palinko. If you like this review, please share it. I don't promote myself enough (or profit from my site in any way), but it is a labor of love and I get great joy out of sharing insights, photos, and finding like-minded collectors out there. 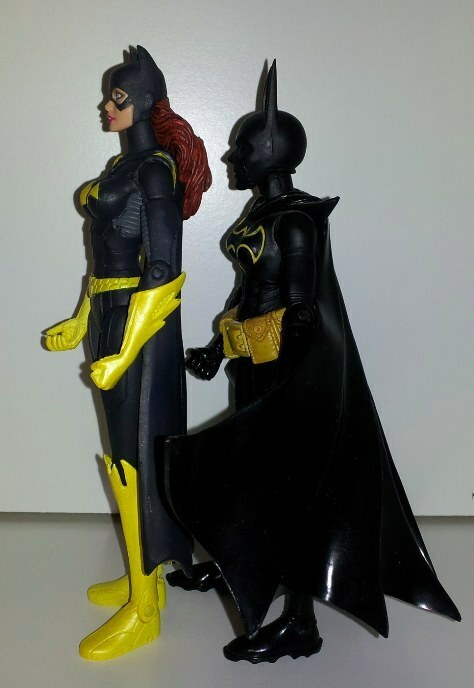 Addendum: A reader asked if Barbara's head could fit (scale-wise) onto the First Appearances Cass Cain Batgirl body. I was curious to check this for myself. Unfortunately I couldn't get Cass' head off (I didn't pull too hard honestly) and I was afraid of Barbara's hair becoming detached like I heard about in toynewsi's video review. So, long story short, the two pics below are quick sloppy photoshops based on the side-by-side pics at the bottom. Despite the scale difference when next to each other, the head actually works very well on the Cass body. I'm confused about DC Collectible heroines right now because Superwoman's articulation was so grand, but all the subsequent figures have been subsets of her. However, Earth 2 Wonder Woman is a favorite of mine. Batgirl's broach does look bad--when I first saw your pics, I mistook it for bleed or rub-off from the cape. Yeah her broach is a hot mess. Mine actually isn't as bad as some out there believe it or not. I think I'm going to try to touch it up so it looks like the bat-logo. I'll let the Greg Capullo figure be the non-broach version. I think it's kind of interesting that DCC is approaching articulation on a case-by-case basis. I feel like torso cuts on Batgirl or Supergirl would have really disrupted the sculpts. I've never actually given the Earth 2 WW much of a chance. I try to limit my Wonder Woman for budget reasons. I'll have to check her out. She looks great! I have two questions. Is her head close to the size of the Cass Cain First Appearance Batgirl? And if so, would it be possible to swap the heads? Ever since this figure was announced I've wanted to use her to create a Helena Bertinelli Batgirl. Very good questions! I was afraid I would break Cass' neck trying to get her head off so instead I took side-by-side photos (being sure that there feet were lined up) and then did a quick photoshop swap (Posted above). I think it looks pretty good! I'm not sure about the mechanics of the swap though. Good luck! Whos better this or the greg capullo version?